Posted by John Taylor in netbooks, PC Industry. I’m now trying life at work with a new netbook, I gave up on the Intel Atom N270 powered Dell Inspiron 910 after less than one week and returned it to Pat Moorhead. As attractive as the Dell exterior was on that netbook – it looked like a high quality little machine – it was barely usable to do much more than use a basic browser for reading. During our event last week in which several reporters came to the AMD Lone Star campus to see “Istanbul” six-core server CPUs demonstrated for the first time, I experimented and used the Dell 910 all day. The event was held on the other side of campus from me in the Customer Engagement Center, and I wanted to see how the Dell netbook would work during a day of meetings and note taking while trying to stay on top of email. Keyboard arrangement. Even the misplacement of one key – in this case the apostrophe – greatly reduced the speed and accuracy of my typing. By the end of the day, I concluded I typed faster with my thumbs on my blackberry due to fewer errors. That’s it in the photo down by the left arrow key where a CTRL key usually sits. Bloatware. as bad as bloatware is on many OEM PCs, it seems to be debilitating on an Atom-powered netbook. In my experience startup times were slow, browser loads were slow. Perhaps Intel could help bloatware inclined OEMs deliver the ability to have a zippier experience when you need it with a tool like the AMD Fusion for Gaming Utility and shut down all those unneeded processes? Wake and recovery from various power and sleep states. It’s possible I could have gone into the BIOS and done some serious troubleshooting to amend this, but the little guy always seemed confused about recovering from a suspend or sleep state. Several times it would not recover with keystrokes, the screen remained black, and when I tapped the power key it shut all the way down. On the plus side, the Dell got about 3.5 hours of battery life with Web and lightweight application use. I used the S10 for the last week as my main device in AMD meetings across campus and a few nights as an email tool at home. I also let my 9 year old borrow it for a bit to look at ways to spend a $25 Target gift card on line. My main applications used thus far on the S10 are Internet Explorer 7, Destroy Twitter, Yammer desktop application, and Microsoft Outlook Web Access. Lenovo provided a relatively bloatware-free image and, despite using the same CPU, there is a noticeable difference in faster application and browser load times compared to the Dell 910. Good responsiveness in all sleep and power states. Like the Dell, the S10 is a good looking little device with a couple design accents. 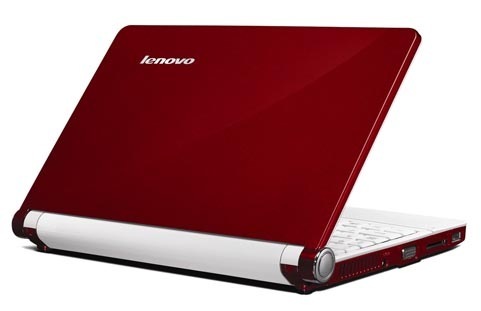 The Dell has its glossy shell and logo, the Lenovo a fancy hinge with a splash of polished steel. A keyboard that felt far more natural to use. But less battery life than the Dell – I’m averaging under 3 hours. However, when my son tried out target.com on the S10, that netbook fatal flaw revealed itself. It just seems intuitive that something called “netbook” would be good at running “the net” if nothing else. But thanks to that 1024×600 screen, the first site my son wanted to use did not display properly. 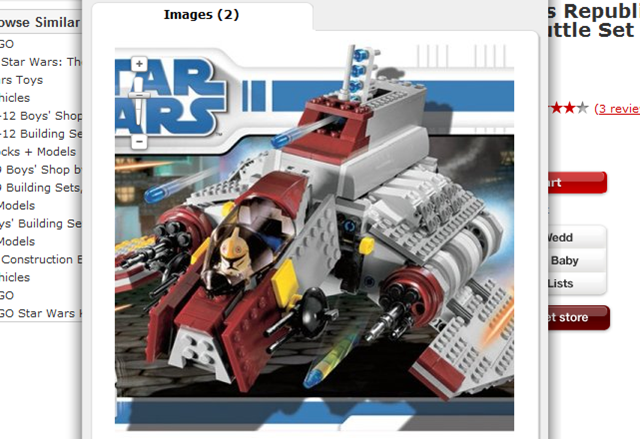 As he scrolled through Lego Star Wars sets, he noticed that the buttons that controlled the product image he was viewing were cut off. He couldn’t easily click “close” nor click the thumbnail for the next picture. So let’s leave it at this for now: The S10 helped me see a little more of the basic attraction to netbooks in that I was able to use some of my Web-based email and social media desktop applications with decent productivity. But it failed my son’s test immediately. All things considered, I remain convinced that AMD is on the right path with “Yukon” and “Congo” and it would be ideal to see Dell and Lenovo join HP in offering affordable, ultrathin designs with real keyboards and the full Web. Posted by John Taylor in netbooks. Earlier this week I read a reference to the Intel Atom netbook processor as “recession proof.” I think for anything to be recession proof, it must offer bullet-proof value. I know the AMD Yukon platform and upcoming HP DV2 will offer bulletproof value as an ultraportable notebook after using one extensively at CES 09. Gorgeous HD visual computing, man-size keyboard. But light and sleek like a Trek racing bicycle made from carbon fiber. How a real man like Popeye fell for a neck like this is an enigma wrapped in a riddle shrouded in mystery. This weekend, I borrowed a new Intel Atom N270 powered Dell Inspiron 910 netbook from Patrick Moorhead. My intent is to keep my knowledge of netbooks and ultrathins sharp. But I can already tell you, no way in hell would I want to write this blog on that netbook (or others like it; the Dell I believe is a cut above the current netbook crowd). I know this isn’t breaking news, but I can quickly categorize it as purely a Web consumption device. And as an aficionado for 3D visual computing, after 30 minutes I was left craving my self-built desktop with its bright 19” NEC Multisync 90GX display like no notebook ever left me. While I do believe that some things are recession-proof, I stand convinced that for netbooks and affordable ultrathins to achieve anything like the 100+ million units projected in the next few years, the category desperately needs AMD and Nvidia. Intel knows how to make tiny cheap CPUs – give them credit. But Intel is lost when it comes to 3D and visual computing. Also considered recession-proof yet proven to actually be so during the 20th century? Spirits. (Read this section as though it were a Sam Elliott voiceover). Why is Tito’s Handmade vodka my brand of choice in tough times? Pour yourself a glass of what the Wall Street Journal calls “America’s first craft sippin’ vodka” and visualize yourself surveying a sunset in the Texas Hill Country where this one-of-a-kind vodka was made. For $30 bucks in Austin, Texas, you can buy nearly two liters of “Double Gold World Spirits” Tito’s Handmade Vodka. That’s a big bottle, no compromises, no regrets. See the value. Although a first-rate vodka, Tito’s doesn’t resort to ensnaring you with pretty pictures of flying French geese or fancy frosted bottles with necks like Shelley Duvall. With Tito’s you get a glass-bottom-boat-sized view of your exceptionally distilled and cleansed vodka. No more, no less.